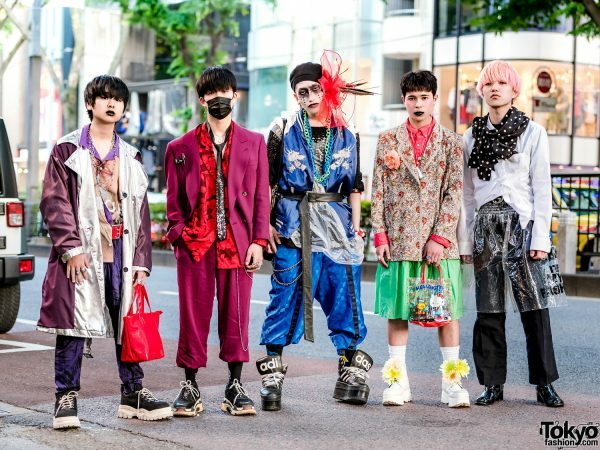 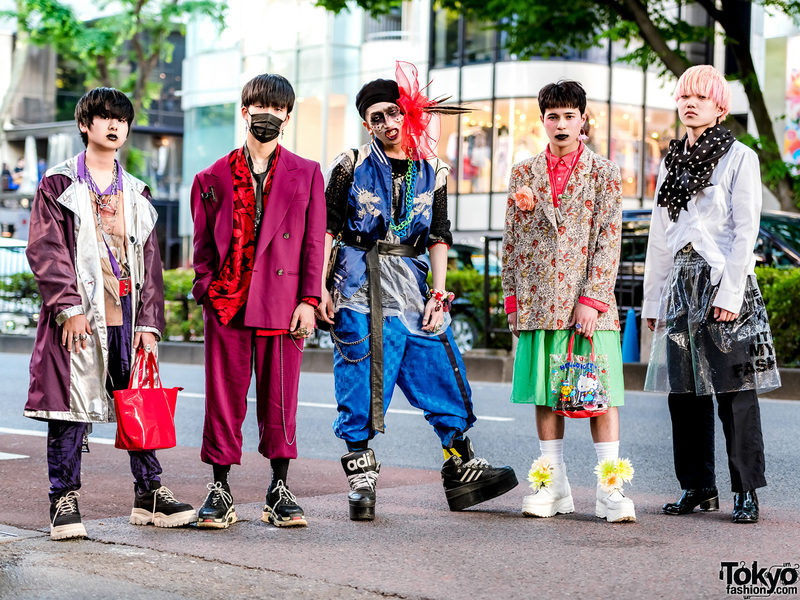 While out on the streets of Harajuku, we came across this group of teens wearing striking and creative street styles. 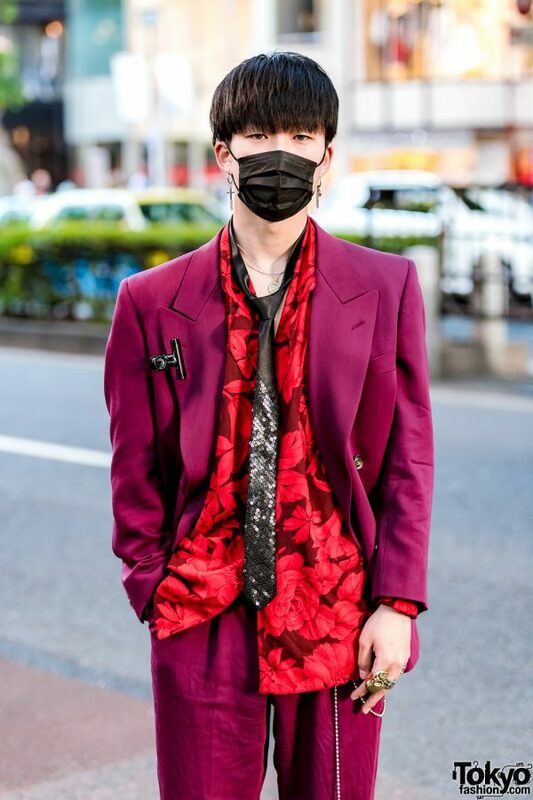 First off is 16-year-old Taira, who is clad in a two-tone dark purple and silver coat with oversized lapels from Never Mind the XU, worn over a purple printed silk shirt from Faith Tokyo and tucked into vintage purple graphic print pants. 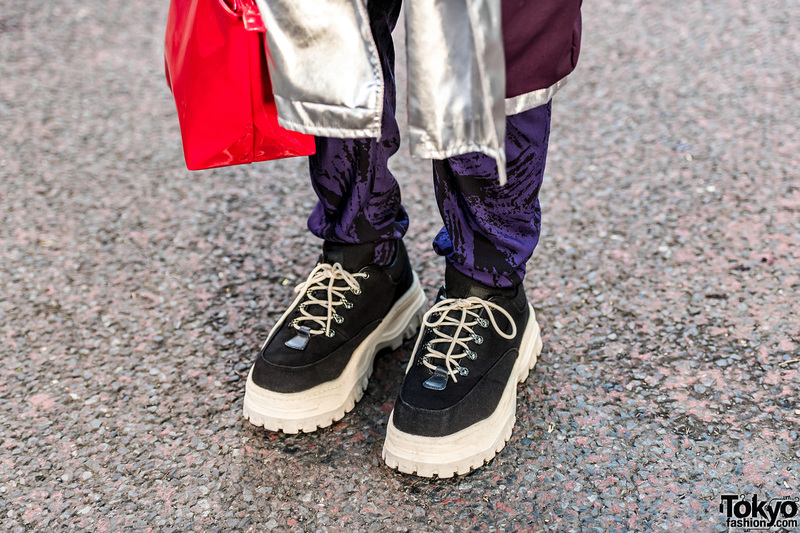 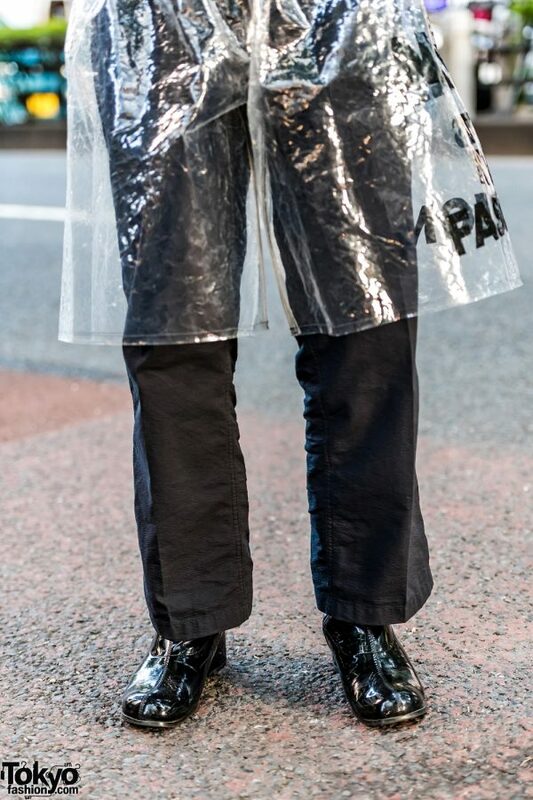 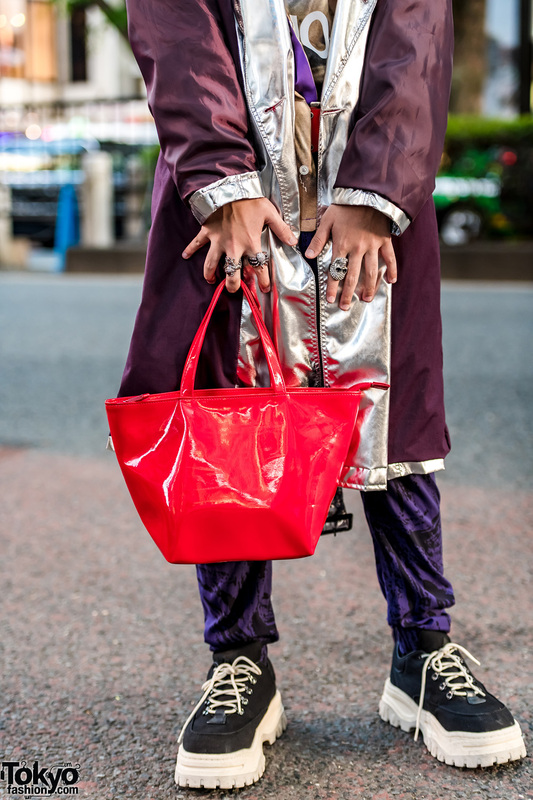 Eytys two-tone lace-up shoes, a red patent leather tote bag, and accessories such as layered chain and safety pin necklaces, a red grommet belt, silver knuckle rings, and black lipstick completed Taira’s street style. 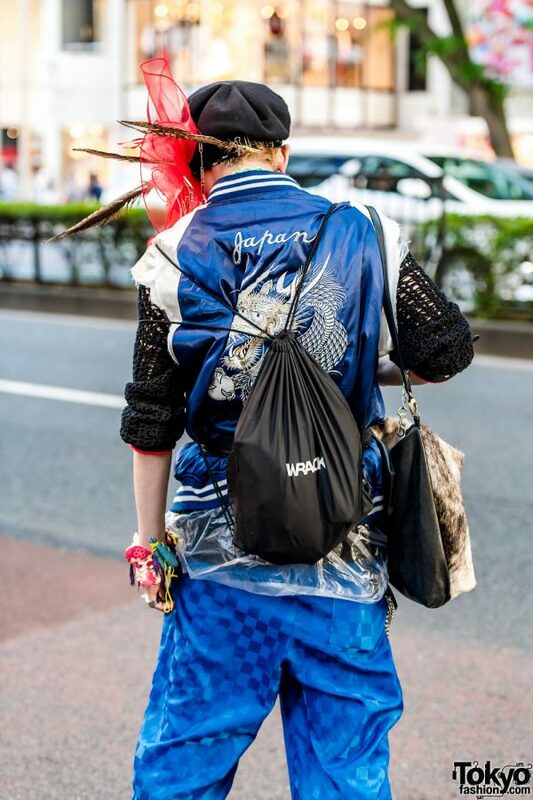 His favorite fashion brand is Eytys, and he likes the music of Yui. 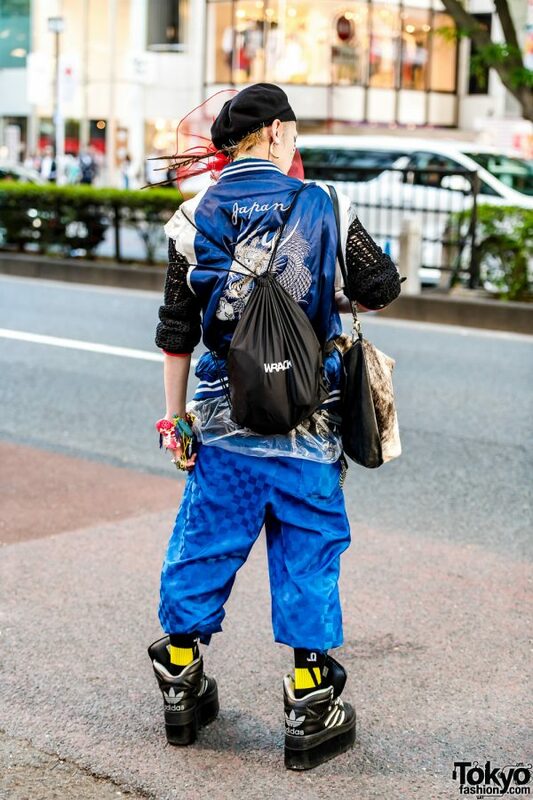 Taira is active on Instagram. 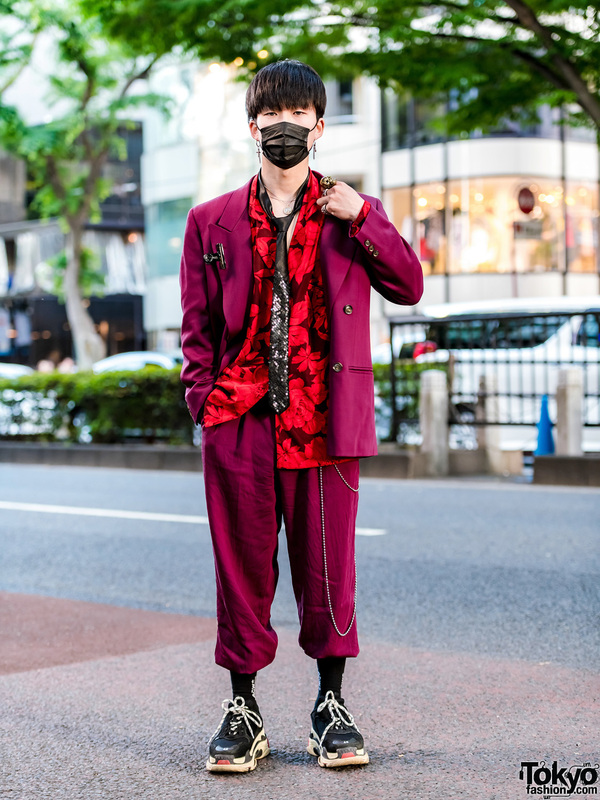 Wearing a black mask is Sei, a 16-year-old student. 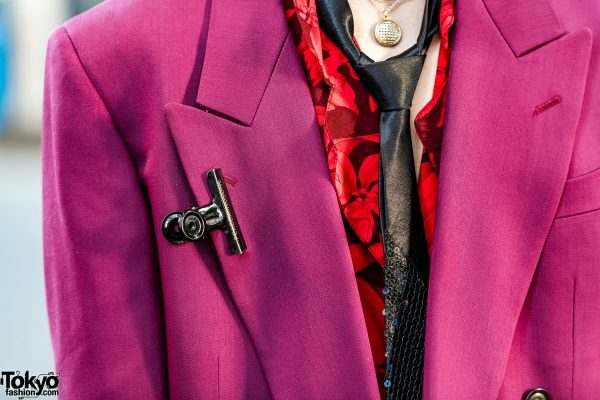 He is dressed in a vintage fuchsia suit, styled with a red floral print shirt from Kinji. 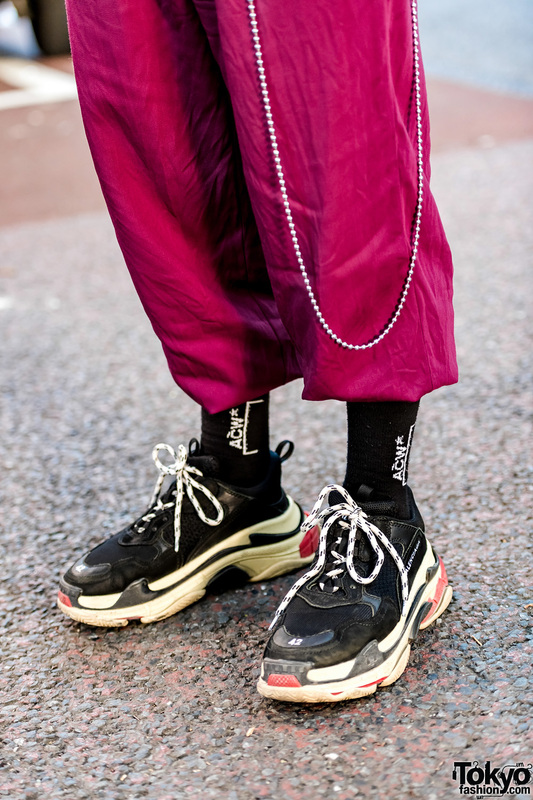 He tucked his matching fuchsia dress pants into black socks, slipped into Balenciaga sneakers, and accessorized with silver cross chain earrings, layered necklaces, a black sequin necktie, multiple knuckle rings and a silver wallet chain. Balenciaga is Sei’s favorite fashion brand, and he likes the music of Big Bang. Sei is also active on Twitter and Instagram. 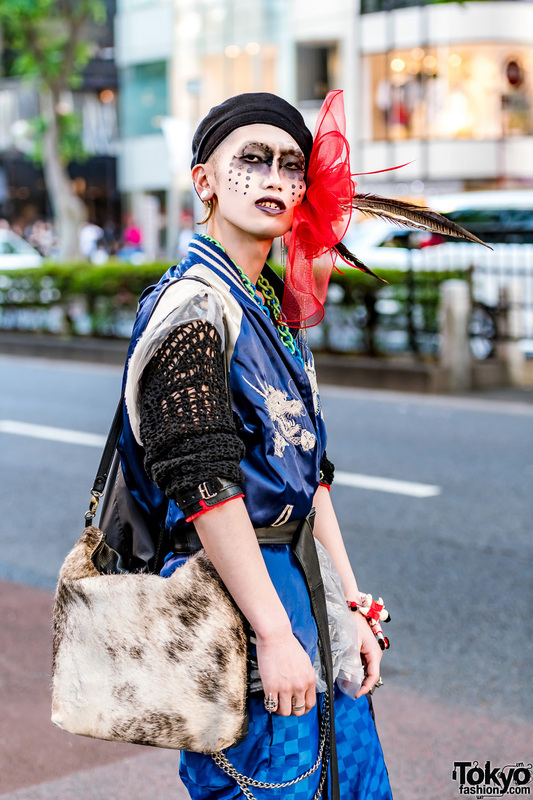 At the middle is TKM Freedom, a 21-year-old graphic designer sporting black makeup and a red mesh headpiece. 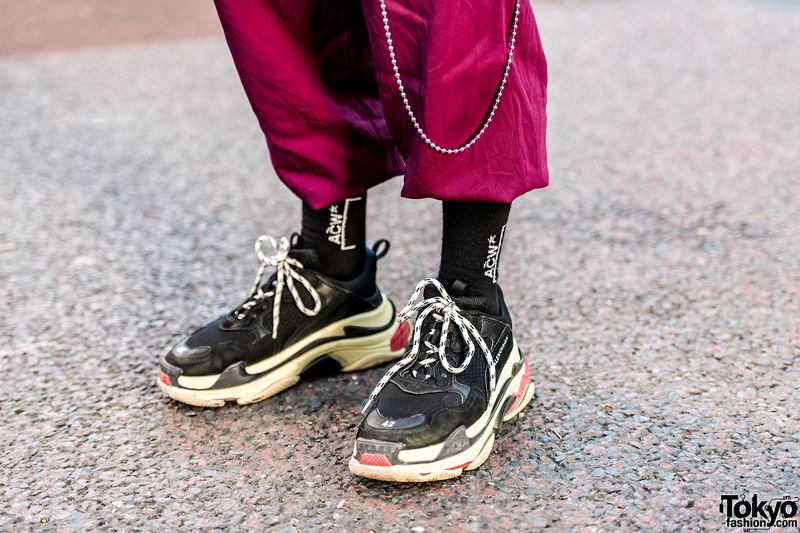 His street style features a vintage satin bomber jacket with sleeves ripped off, worn over a black knit top, layered with a vinyl plastic top, and paired with blue satin checkered track pants from Puma x Fenty. 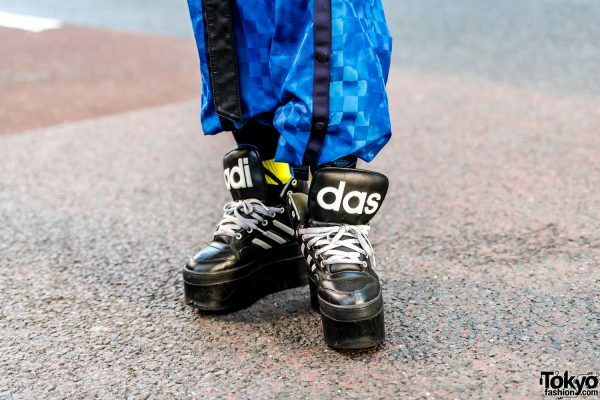 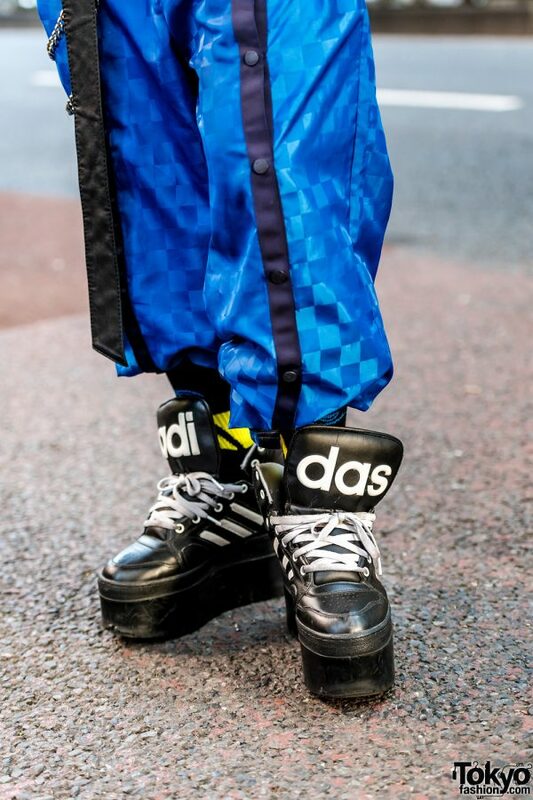 He finished off his look with mismatched socks, platform Adidas sneakers from Dog Harajuku, a fur sling bag from Prime Cut and a black Wrack drawstring backpack. 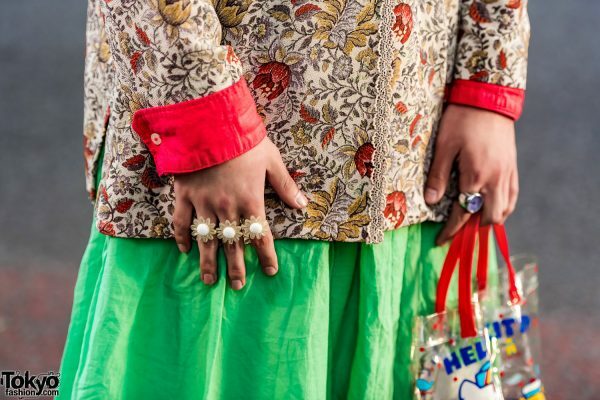 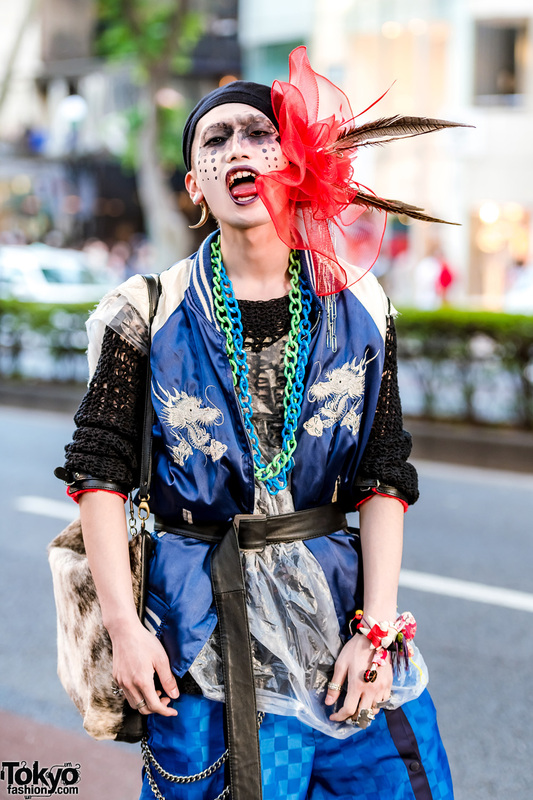 Accessories from Seiyu include a mesh headpiece with feathers and paper clips, layered green and blue chain necklaces, a long black belt, a colorful bracelet and silver knuckle rings. 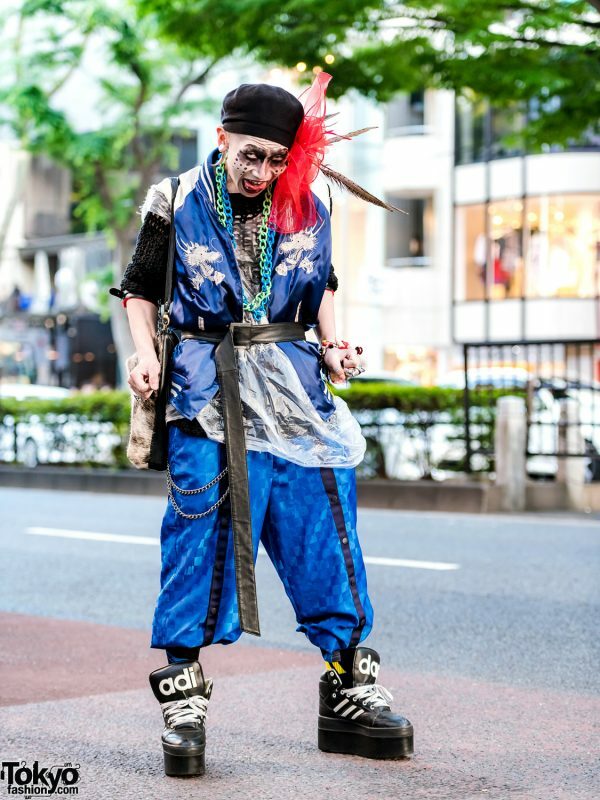 TKM loves the music of Bara Club, and he is active on Instagram. 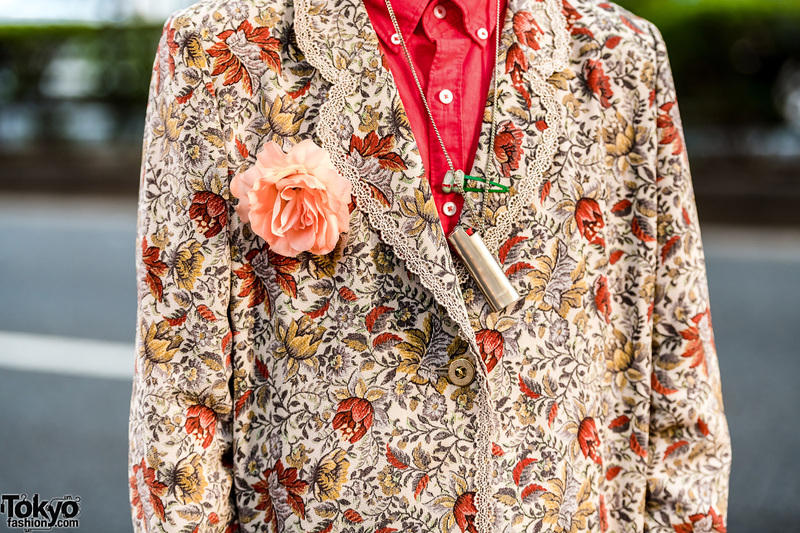 Meanwhile, Sou – a 17-year-old student – is decked out in a vintage floral print brocade blazer with a laced lapel hem, worn over a red button up long sleeve shirt from American Eagle and paired with a green skirt. 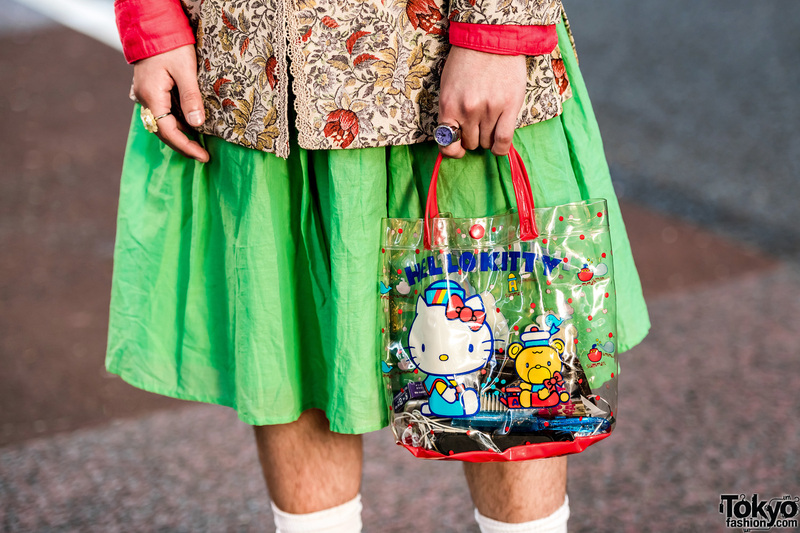 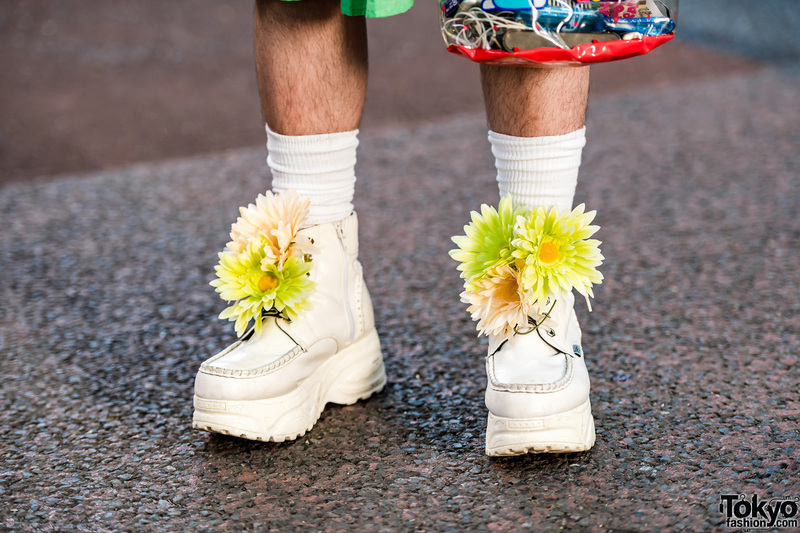 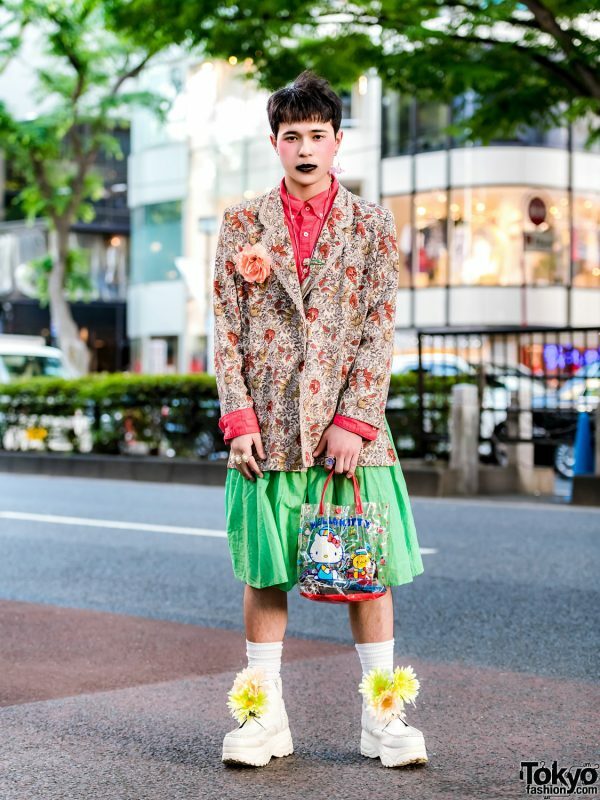 He completed his striking outfit with white socks, handmade platform lace up shoes from Yosuke embellished with flowers, and a clear Hello Kitty tote. His accessories – from Ambush and Kinji – include a single floral drop earring, a lighter holder necklace, a watch ring, floral rings, and a floral boutonniere. 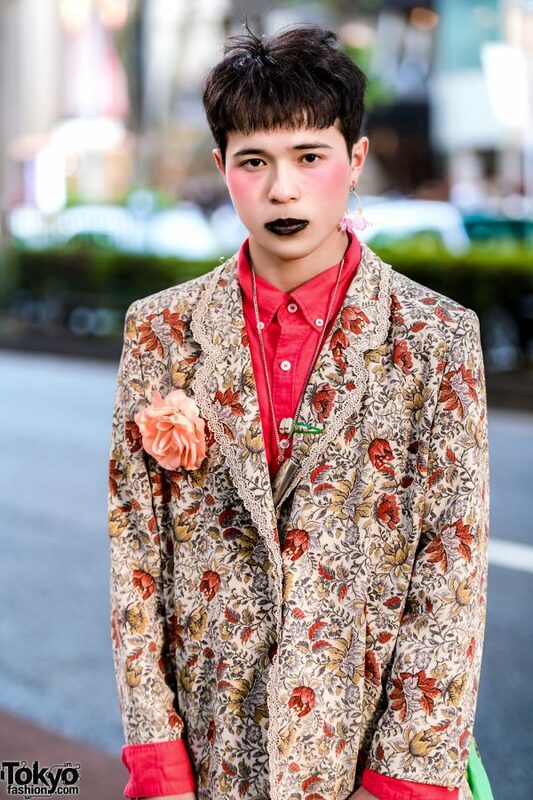 Sou’s favorite brands include Yohji Yamamoto and Comme des Garcons, and he enjoys the music of Hide and Boowy. 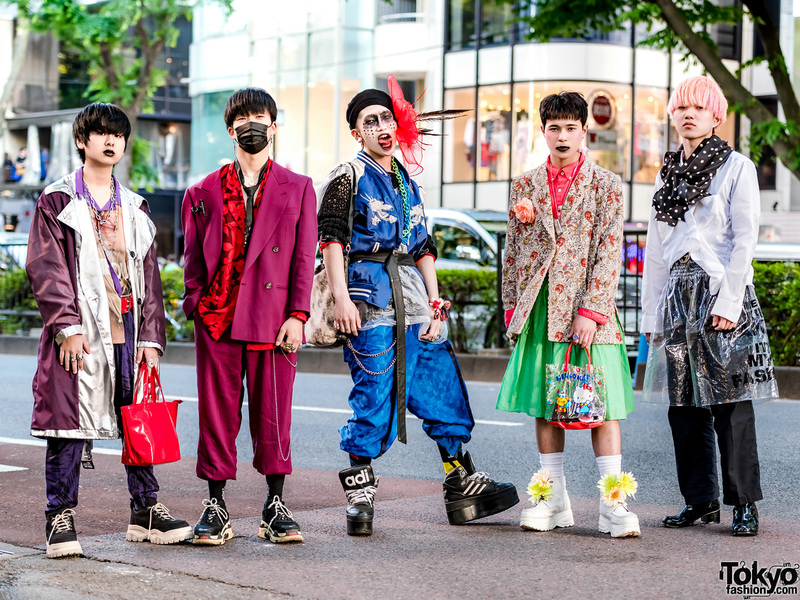 Follow Sou on Twitter and Instagram. 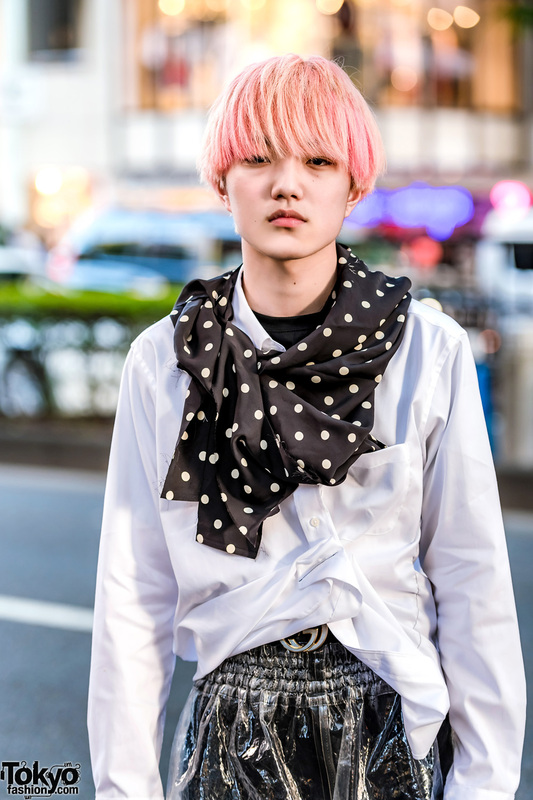 Lastly, pink-haired Kiku, a 16-year-old student sporting a monochrome ensemble. 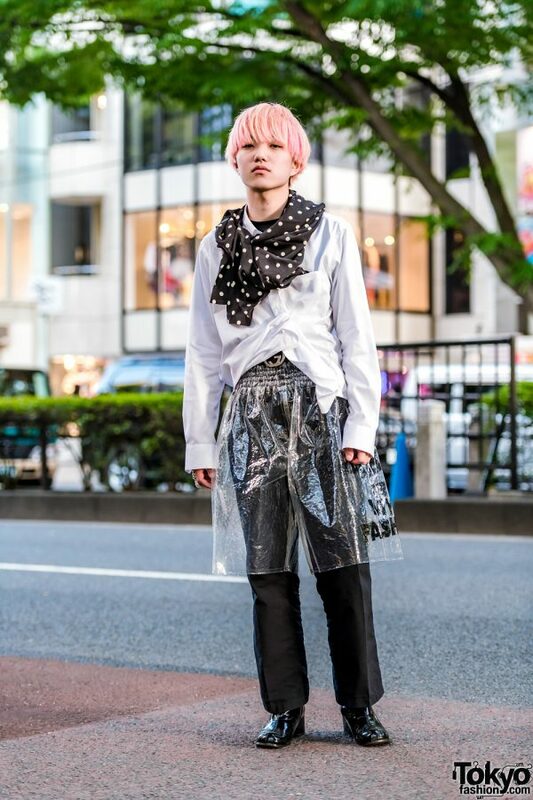 Kiku is wearing a white Limi Feu remake long sleeve shirt, styled over a black shirt from @sirarin0914. 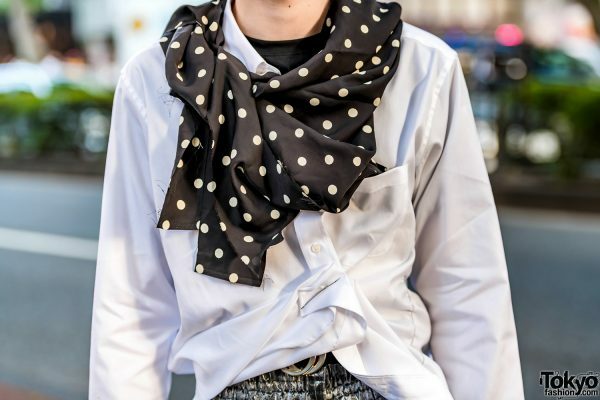 He embellished his layered tops with a black polka dot scarf and paired them with clear shorts from Comme des Garcons and black Christian Dior pants. 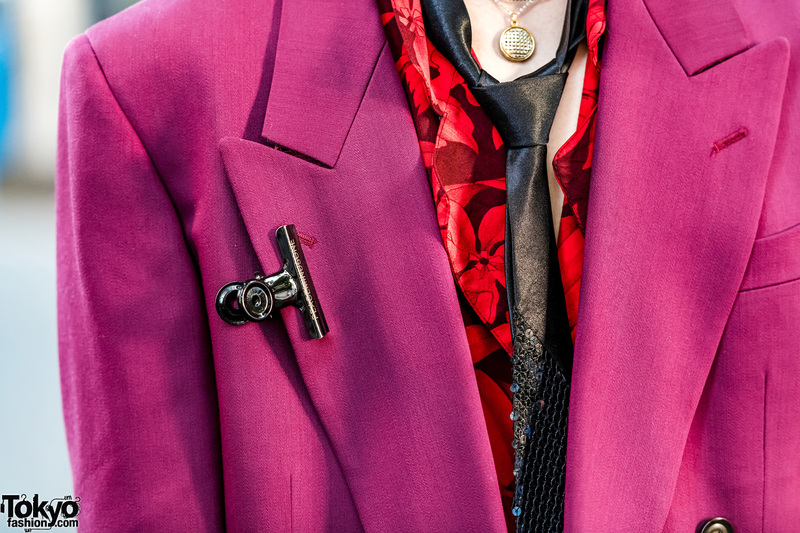 He finished off his style with black patent leather boots, a Gucci belt, and multiple knuckle rings. 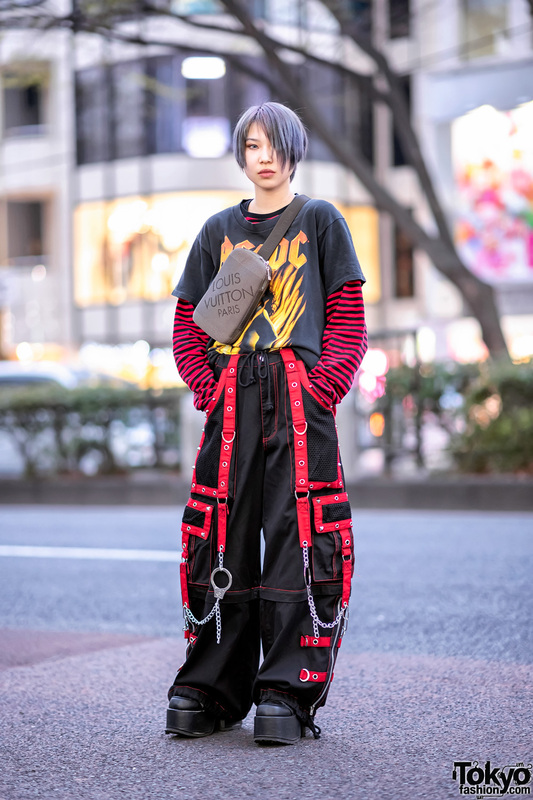 Kiku lists Balmung as his fashion favorite, and he likes listening to the tunes of Nagisa Kuroki. 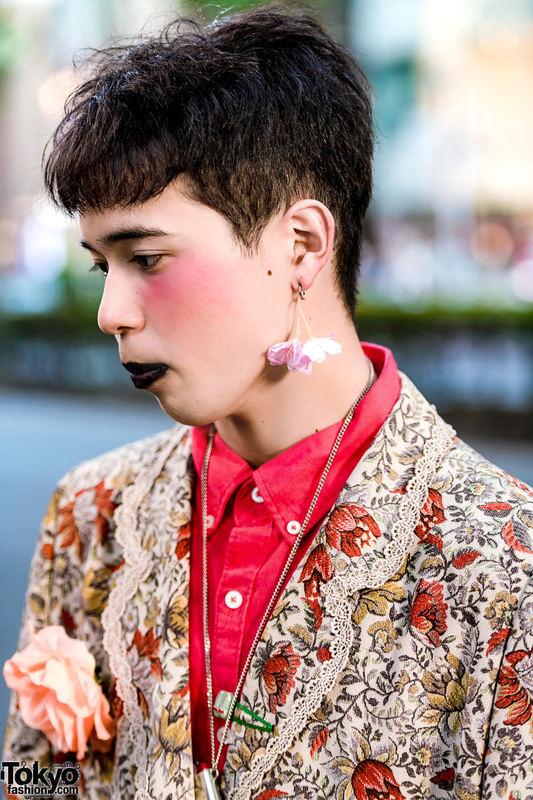 He posts fashion photos on Instagram.